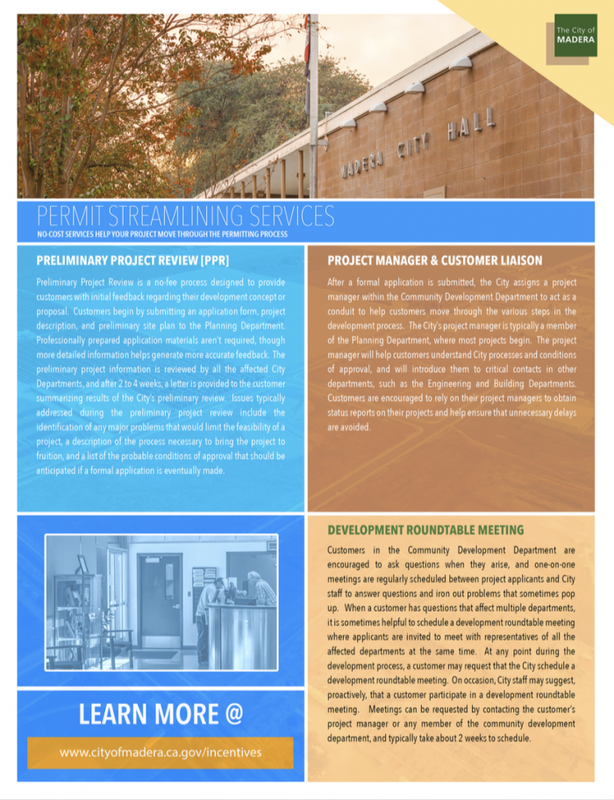 Building and Development fees are approved annually through the adoption of the City of Madera Master Fee Schedule. The intent of each fee is to collect a portion of the total cost of each activity. Fees in the following categories are generally applied to building and development projects in the City. 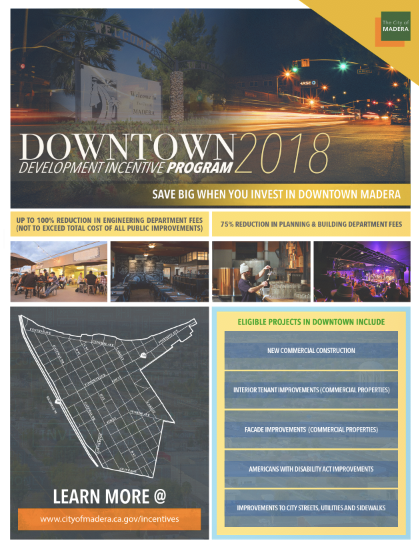 Newly proposed incentive programs offer significant reductions in permit and processing fees in three separate categories: the development and redevelopment of properties in downtown Madera; the remodel and renovation of older buildings and buildings that have experienced long vacancies anywhere in the City; and building projects that will be used in conjunction with tax exempt, non-profit operations, with each of the three programs providing for reductions between 50% and 100% in land use permit fees, building permit fees, and public facility engineering fees for qualifying projects. 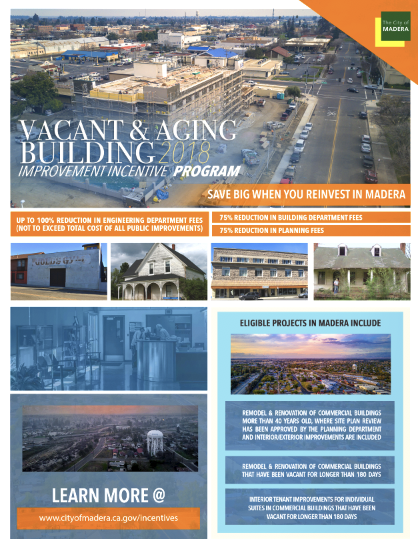 To view a list of all fees required for building, development, facility rentals, planning, police, permits, public works and more, click to view the City of Madera's Master Fee Schedule. View the Master Penalty Schedule by clicking here. Fees charged for land use applications and permits, which is typically the first step in the development process. Common examples of land use applications are site plan reviews, conditional use permits, and subdivision maps. Fees charged for working or making improvements within the public right of way. Public improvements triggering these fees are commonly required in conjunction with new development, and may include street, sewer, water, storm drain and other improvements. Fees charged for plan checking, inspection, and permit issuance in conjunction with building projects. Building Permit and Inspection fees are applied to new construction, remodeling, and installation of equipment. Examples of projects where fees are applied include the construction of a new home or office, a bathroom remodel, installation of an air conditioning unit, and installation of a new roof or new windows. Fees charged for new residential, commercial and industrial construction projects to pay for the cost of new public improvements necessary to serve new development. 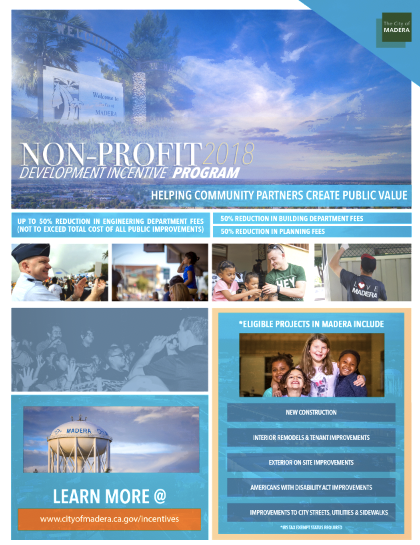 Development Impact Fees are utilized by the City to construct necessary public improvements, or to reimburse developers when they construct eligible improvements. Development impact fees are collected for improvements such as arterial and collector streets, sewer and water pipes, water wells, and fire stations.